Helical milling is a hole-making process which can be applied to achieve high-quality finished boreholes in hardened steels. Due to the drilling process limitations, which are intensified when applied in hardened steels, the helical milling process can be applied on hole-making tasks in moulds and dies industry, since milling have been widely applied in moulds and dies machining to replace high-cost operations like grinding and electrical discharge machining. However, to succeed in achieving high-quality boreholes in hardened parts, which presents high added value due to previous operations, tool wear in the helical milling of hardened steels should be more investigated. In the present study, dry helical milling tool life tests were conducted in AISI H13 hardened steel parts, varying the cutting velocity. The flank wear on frontal cutting edges was progressively measured through optical microscopy, and SEM/EDS was performed in frontal and peripheral worn cutting edges. The wear occurred progressively in the flank of the frontal cutting edges with adhesion and oxidation as main wear mechanisms. In the peripheral edges, coating loss, and adhesion of workpiece material in the tool clearance surface were observed, besides fracture in the tool nose flank with the highest cutting velocity. A nested ANOVA was performed to evaluate the burr height in the borehole exit. The tool life stage was statistically significant in the burr height. The authors gratefully acknowledge the Brazilian National Council for Scientific and Technological Development (CNPq), the Coordination of Superior Level Staff Improvement (CAPES), and the Research Support Foundation of the State of Minas Gerais (FAPEMIG) for supporting this research. 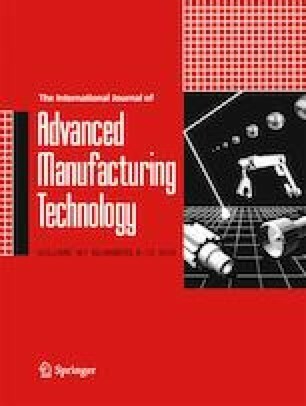 The authors gratefully acknowledge the Foundation for Science and Technology of Portugal (FCT) for supporting the project Sustainable and intelligent manufacturing by machining (FAMASI), process POCI-01-0145-FEDER-031556. The first author acknowledges CAPES for the PDSE grant, process number 88881.133263/2016-01, the Centre for Mechanical Technology and Automation-TEMA, and Department of Mechanical Engineering of Univ ersity of Aveiro for supporting this research.